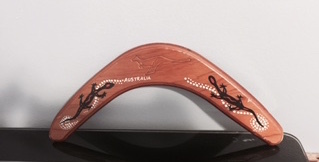 is, of course, a boomerang. A dear friend sent it to me from Australia about 13 years ago. I have displayed it, enjoyed it, moved it, lost it, found it, but until today, I had never played with it. is, of course, Kepler. 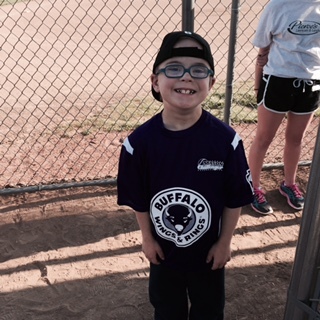 Here he is at his first baseball practice last night, rockin’ the swag, just having a ball. Kepler saw the boomerang today and decided it was to be played with and he invited me to come out and play. As we played, I began to notice some real differences in how he plays compared to how I play. As we would race to the boomerang, he would throw his body to the ground hoping to get that extra oomph that would help him get to the boomerang before I could. I thought about how extremely injured I would get if I threw my body to the ground like that. While on the ground, he would grab a dandelion or three and blow dandelion fuzz (cause kids’ll blow dandelion fuzz, according to the Snowman song from Frozen). He blew the seeds lustily, joyfully, and without a care in the world. All I could see was all the new dandelions that were going to sprout in our dandelion ocean front yard in a few days. Kepler runs all out, all the time. We’d throw the boomerang and then he’d urge me on, “FASTER!” All I could think about was I wonder if my fitbit is getting all these steps recorded, while I tried different methods of trying to look as though I were running (such as the running in slow motion trick). Once I convinced him we should pause to get the mail. He threw the boomerang to distract me from going to the mailbox. He got there first, and then when he finally got the sticky door open, he shouted, “MAILBOX!” When’s the last time you or I shouted mailbox when we opened it? Once I convinced him I was tired and needed to sit on the swing for a few minutes. He escorted me to the swing, looked me in the eye and encouraged me to breathe in one breath deeply (something he has learned from his bouts with croup), and once I demonstrated I could do that, it was time to play again. While playing, Kepler teases, laughs, jumps, twirls, and invites me with his every motion and word to join in with him. While playing, I feel like I creak, lumber, waddle, and wonder when it will be over. I think I’d have to play a little more and little more regularly to get to the place where I thought to tease, laugh, jump, twirl, and just lose track of time, but that sounds like a lot of work fun. How fun! I’ve never actually seen a boomerang in real life. I’d like to try playing with one! The weird thing is, you want to treat it like a frisbee, but it’s really hard to catch AND hard! Made of wood. Doesn’t give!